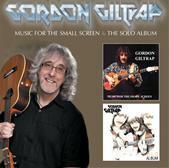 This release contains two of Gordon's albums from the 90s. Disc 1: Music For The Small Screen (originally released in 1995,) features a selection of Gordon's commissions for the BBC and ITV, including Heartsong, his theme for the BBC Holiday Programme and The Carnival, the theme to Judith Chalmers' Wish You Were Here. The specially overdubbed version of Heartsong features guests Brian May, Steve Howe, Rick Wakeman, Neil Murray and Midge Ure. Disc 2: The Solo Album (originally released in 1992) features Gordon tackling pieces old and new without accompaniment. The booklet contains track-by-track annotation for both albums by Gordon himself, as well as photos and ephemera from his own archives.